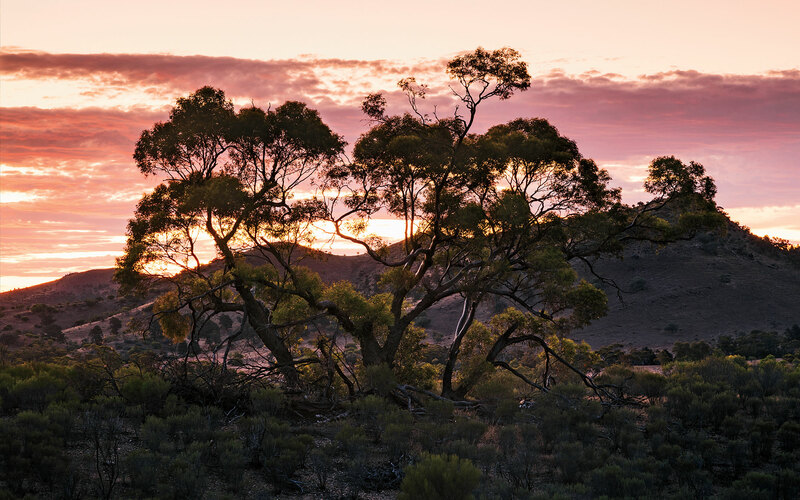 In the South Australian outback, an ambitious tourism and conservation project is returning a 60,000-acre former sheep ranch back into a habitat for threatened species of native flora and fauna. I woke up the first time before dawn and felt around the edge of my sleeping bag for my hiking boots. I shook out my glasses and phone to check the time: 4:20 a.m. A canopy of stars was spread overhead. The notched fin of the Elder Range cut a dark silhouette against the speckled depths. I watched the sky until I saw a meteor's cold streak and then fell back to sleep. The next time I woke up, it was 6:03. First light was on its way but hadn't yet arrived: the constellations were still clear. Fifteen minutes later, dawn had rinsed them all away, leaving the sky pale and flat. A butcher-bird sang and was answered by another behind the camp. Color seeped into the foreground, which before had been rendered in grays. At 6:30, the rocky face of the Elder Range caught the sky's reflection and glowed pink, as if it were the source of all light. Finally, after an hour of watching the day arrive, I saw the first direct rays of sun hit the mountains, and the notched ridge blazed orange, a visual cymbal clash. It was the start of another day of bushwalking at Arkaba, a 60,000-acre private nature conservancy at the edge of South Australia's outback. 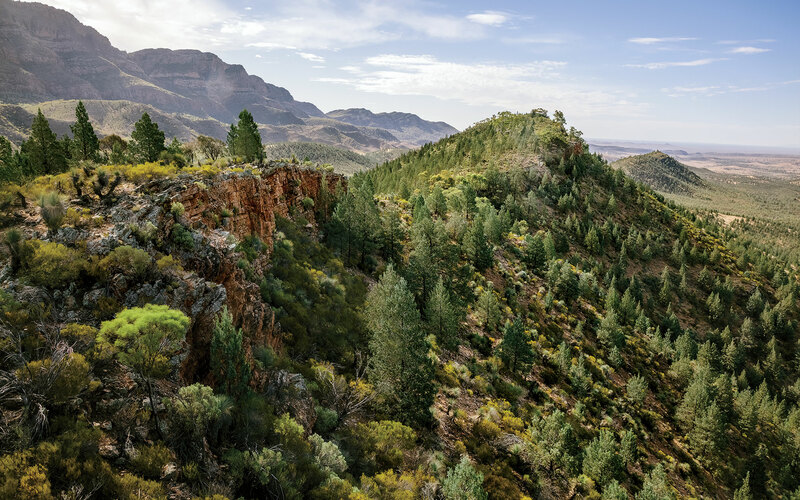 A small group of guests and I, led by a Zimbabwean guide named Paul Bester, had begun our walking safari two days earlier in the adjacent Flinders Ranges National Park. That first morning we had traversed Wilpena Pound, a natural amphitheater formed by 500 million years of erosion, or by two giant sleeping snakes, depending on whether you consult geologists or Aboriginal Adnyamathanha storytellers. After lunch we'd crossed onto Arkaba land, and for the rest of the walk we had been alone on the property, further isolated by the lack of cellular communication and electricity. As we followed streambeds lined with seemingly immortal river red gums and climbed broken hills on the way to the Elder Range, my sense of time slowed from the frantic speed of the Internet to the pace of an unhurried walk. By the third morning, when I lay in my bedroll and watched the sun rise, I could tell that my patience, the ability to sit unbothered by the urgencies of daily life, had been renewed by the raw Australian landscape. I felt recomposed. I had come to this part of the outback, 250 miles north of Adelaide, to witness not just the dramatic splendor of the landscape but also the transformation of Arkaba from a 19th-century sheep station into a 21st-century model of ecological tourism. On my stopover in Sydney, I met Charles Carlow, the head of Wild Bush Luxury, which owns Arkaba. He explained how the property is working to rid its land of invasive species, to reintroduce native flora and fauna, and to create an intimate connection between visitors and their surroundings so that they leave with a deeper understanding of the ecological stakes. "Most Australians have no idea that we have the greatest rate of mammal extinction in the world," he told me over lunch. "It's not something they think about. Australia is highly urbanized—similar to the U.S.—and the divide between the city and the bush becomes greater all the time." Carlow got interested in conservation-based tourism as a result of a trip to Kenya when he was 12 years old, and he modeled the Arkaba Walk, a three-day trek between remote camps, on the traditional African safari. The Arkaba Walk is subtler. Much of the appeal is that this, as Carlow pointed out, is some of the most accessible outback in the country. And some of the most beautiful. 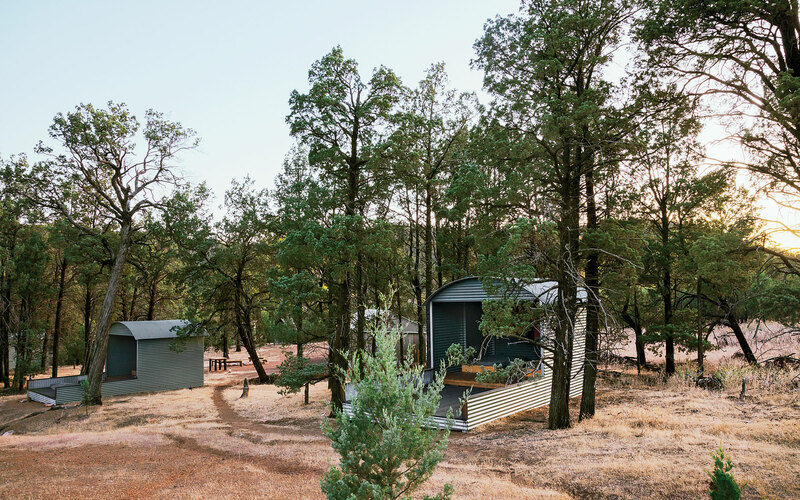 "For us, Arkaba isn't about the accommodations, but what we do with the outdoors," he said. "You're not paying for spa amenities but for the privilege of sharing sixty thousand acres with only ten other people. It's very special—very Australian." Many of the highlights called for a naturalist's magnifying glass rather than a telephoto lens: spotting dingo tracks in an area where they supposedly had been exterminated; learning to identify Salvation Jane, a pretty wildflower that is also a rampantly invasive weed; watching a column of ants bridge a spring-fed trickle by linking their nearweightless bodies into a living pontoon. Such signs and wonders required Bester's sharp eye and thoughtful explanations. The Arkaba Walk was like a semester-long introduction to Australian ecology spread over the course of 27 rambling miles. At the heart of Arkaba is the property's intensive efforts to undo the ecological damage caused since sheep farmers settled the area in 1851. When Wild Bush Luxury bought Arkaba, the property's "low country had been grazed to buggery," Carlow told me. He initiated a conservation plan to phase out grazing by 2013, and today many parts of the property are "in relatively good nick," he said, despite ongoing pressure from feral goats. A fence that separates Arkaba from its neighbor clearly demonstrated the results: there was significantly more vegetation on the ungrazed land. 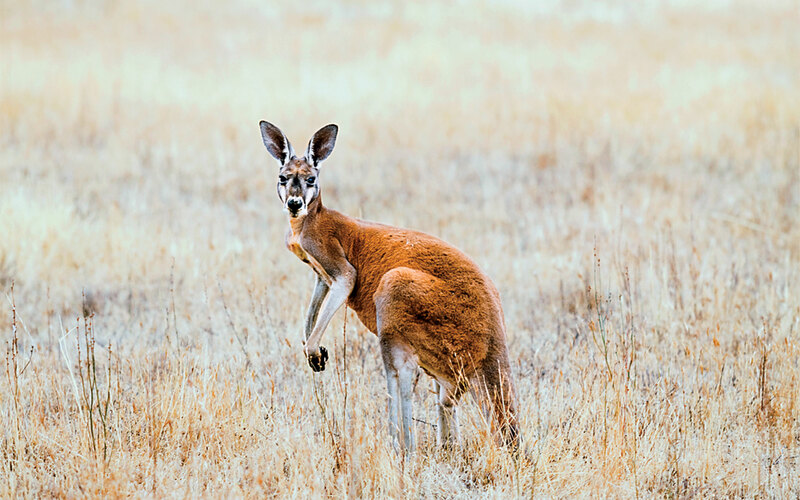 As a result, the local population of kangaroos and emus has boomed, and Arkaba's guides also report sightings of the yellow-footed rock wallaby, something of a mascot for the conservancy. The species was once hunted for pelts, and more recently its survival has been threatened to near-extinction by predation and habitat loss. "We now have two colonies," Carlow said. "That didn't exist two years ago." But removing sheep was the easy part. Arkaba's ongoing conservation efforts focus on the more pernicious threat of foxes and feral cats. Their impact on wildlife and birdlife has been profound. "The cats and foxes nailed a lot of small marsupials and small mammals before anyone knew what was happening," Carlow said. As much as 10 percent of Australia's endemic mammal species have gone extinct since colonization, he added, and some areas of the country have lost 75 percent of their small mammals and marsupials in the past 10 years, leaving many of these species now in collapse. In this sense, Arkaba represents a microcosm of a global ecological calamity—the damage done by exotic species. The American landscape is a catalogue of noxious weeds and invasive pests that have disrupted native ecosystems: Japanese kudzu in the South, African tamarisk in the Southwest, Amazonian water hyacinth and Burmese pythons spreading through the Everglades, Russian zebra mussels choking the Great Lakes, Asian carp invading the Mississippi River system, and European brown rats everywhere. The impact of invasive species is particularly acute on islands. In Hawaii, bird populations have crashed since the introduction of rodents and voracious tree snakes. On a much larger scale, New Zealand's struggle to eradicate exotic species has risen to the level of a national emergency, and victory is declared on the poignantly small scale of a few dozen square miles at a time. A successful case study is the tiny, subantarctic Campbell Island, where the government removed cattle and sheep before successfully eradicating rats in 2001, leading to the recovery of seabird populations and other endemic species that were on the brink of extinction. In the far South Atlantic, the government of the Falkland Islands launched the world's largest successful crusade against rats on South Georgia Island, a 1,450-square-mile bird sanctuary; the next step was to eliminate reindeer introduced by Norwegian whalers for meat over a century ago. Australia is also an island ecosystem, though it's an exceptionally large one. Its fragile ecology has been reshaped by some 130 invasive species that have arrived since colonial settlement. And while Arkaba's conservation work represents a mere speck on the continent, it nonetheless provides an example of how an intense conservation push can begin to mitigate the damage done by out-of-control pests. "We can't presume nature will take care of itself," said Arkaba's chief conservationist, Brendon Bevan. "We've affected nature, and only we can rectify it." All of this I learned by degrees during my visit, starting with the first night's dinner at the Homestead, a 19th-century stone farmhouse converted into comfortable if not extravagant lodgings. I drove five hours up from Adelaide and arrived in time to meet Bester and Bevan over a glass of Riesling from the nearby Clare Valley. The other guests had already arrived: a retired couple in their late sixties from New Zealand, a high-powered pair of Sydney professionals, and a single woman in her thirties who was originally from Adelaide but now lives in Los Angeles. Bevan and Bester left us after drinks around the bonfire, and we sat down for a homey meat-and-potatoes dinner alfresco. The next morning we set out for the national park, half an hour away. Arkaba staffers would ferry our bags between camps, which were glamping-style accommodations with bucket showers, and cook our meals. The semiarid landscape reminded me somewhat of Utah's red-rock country—dry gulches, rusty bluffs, scattered scrub trees, and tufty grass. It was late August, nearly the start of the antipodean spring, and I was surprised by the cool weather and relatively verdant vegetation. I'd been expecting a Mad Max dustscape. Bester explained that summer heat parches the ground every year and that the entire region is subject to lengthy droughts and periodic wildfires. The wet-season growth I saw was what originally attracted settlers to the region, but it was only deceptively lush. Unaware of Australia's drought cycle, herders overstocked the land with up to 100 sheep per square mile, destroying native plant communities and leading to catastrophic stock losses when the rains failed. Invasive weeds followed in the flocks' wake. Creek beds were hardest hit, and Bevan's wife, Kat, describes the thick stands of exotics along Arkaba Creek—some 30 species including ward's weed, soursob, nettle-leaved goosefoot, and African boxthorn—as a "hectic catastrophe." The aggressive spread of Salvation Jane across former native grasslands gave rise to its other nickname, Patterson's Curse, named after the hapless settler who imported seeds in the 1880s to plant an ornamental flower that would leap the garden fence and run amok. We arrived at the national park, donned our daypacks, and headed up a creek drainage toward Wilpena Pound. The path led through a magnificent riparian forest of river red gums, a blue-green-leafed eucalyptus that can live up to 1,000 years. The trees, some of them seven feet in diameter, shed their bark to reveal trunks that gleam dully like old silver. The Pound is a 25,000-acre flat-bottomed bowl ringed by mountains—Wilpena derives from an Aboriginal description of a cupped hand. 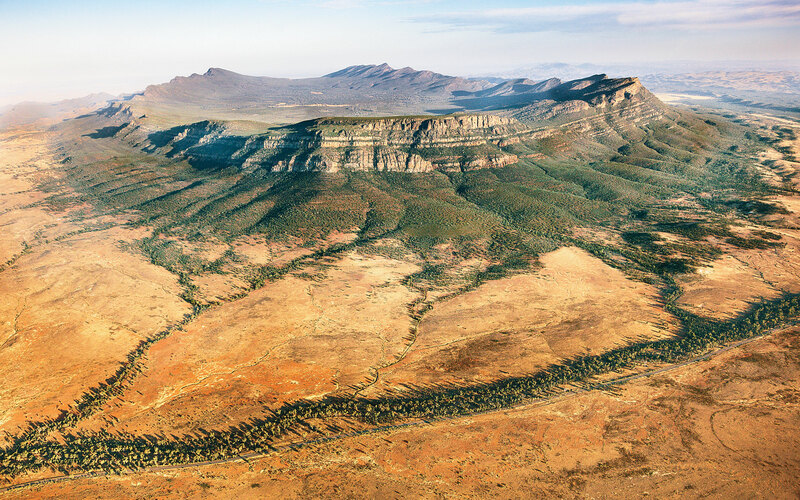 Although less well known to foreigners than Uluru and the Great Barrier Reef, to South Australians it is an iconic feature of the Flinders Ranges, a series of ancient mountains named for explorer Matthew Flinders, who circumnavigated Australia in 1802. After European settlers brought sheep to the Pound, the Australian government completed a 3,500-mile "dog fence" in 1885 to exclude dingoes from the southeast part of the continent. Shepherds killed hundreds of dingoes, possums, and kangaroos. Foxes, introduced for sport, and feral cats decimated the yellow-footed rock wallabies, along with other uniquely Australian species like bilbies and bettongs. In 1899, homesteaders planted wheat in the Pound's near-sterile ground, more rock than dirt, but drought soon made folly of their efforts. The launch of Operation Bounceback 23 years ago, a government initiative to rid the park of pest species, has helped the rock wallabies recover. We paused for lunch under a huge coolibah tree, another native eucalypt, and the couple from New Zealand sang a few lines of "Waltzing Matilda," a "bush ballad" or folk song that is Australia's unofficial national anthem: "Once a jolly swagman camped by a billabong / Under the shade of a coolibah tree." In the distance, we could see the park's three commonest macropods—the red kangaroo, the western gray kangaroo, and the common wallaroo or euro—and I was reminded of Tanzania's Ngorongoro Crater, an enclosed sanctuary for threatened species. "There's water and fresh veg, so why would you move?" Bester said, to explain the seasonal density of wildlife in the Pound. "But in the summer they'll move up to fifty miles per day." That afternoon, Bester was delighted when we spotted a fresh dingo track—evidence that the dog fence hadn't been entirely successful—but as we descended onto Arkaba land via Bridle Gap, we saw less-welcome animals. Thirty or so feral goats moved across a ridge. "That's a problem," Bester said. He explained that the goats compete aggressively with native grazers for vegetation, and that they monopolize springs, effectively driving the shy rock wallabies away from their only water source. Arkaba controls goat populations by rounding them up for sale or by aerial culling. That night we made camp at Black's Gap, in a cluster of open-sided huts facing the hills. The next morning, we set out along the Heysen Trail, a hiking route named for Hans Heysen, a German-born Australian painter. His early-20th-century landscapes based on his travels through the Flinders Ranges helped establish a national iconography of arid hills and gnarled gum trees aflutter with roseate cockatoos. It was the exact landscape that surrounded us. As we made our way down a dry wash, the color of the stones underfoot perfectly matched the river red gum heartwood we burned in the morning's campfire. Bester suddenly held up a hand to stop us and pointed to the lapidary sparkle of a mulga parrot, so much brighter than the Australian ringneck parrot we'd seen in camp earlier. "Very special," he said. "That's one of those species people come from around the world to see. That was awesome." Arkaba's progressive conservation efforts face challenges in this deeply conservative part of the country. Bester gave us an example when he pointed out the nest of a wedge-tailed eagle, one of the world's largest raptors. They were once shot as vermin, but their numbers have rebounded, thanks in part to the overabundance of nonnative rabbits—one benefit of an introduced pest. Today the nest was empty, but Bester spotted a pair of "wedgies" aloft on thermals overhead, their seven-foot wingspans like dark lint on the featureless blue. It reminded him of a conversation he'd overheard in a local pub, where an old rancher said he'd just seen two wedgetails feeding on a roadkill kangaroo. "He said, ‘If I'da had my rifle, I woulda shot them both,' " Bester recalled, shaking his head. "That mentality still exists." At lunch in Madge's Gully, a narrow smooth-rock canyon, Bester pointed out a small seep dampening the sand. Since Arkaba removed the windmillfed stock troughs, natural springs were starting to reemerge after 80 years of pumping. The kangaroos and wallabies would need the water come summer. That afternoon, we climbed for hours to the crest of the Red Range, then descended into camp at the base of the Elder Range. Tired from the walk and relaxed from the Barossa Valley Shiraz, I turned in early and awoke before dawn seven hours later. On the last morning, we set out to the sound of parrots, red-capped robins, and yellow-throated mynah birds, but the highlight of the day was provided, oddly enough, by the ubiquitous cypress pines. A faint breeze stirred and caused the male trees to release their pollen, ejaculating clouds of copious fertility. Suddenly an entire hillside was going off, and the slanting morning light turned pollen into gold dust. The sight made us giddy, and we gasped "ooh!" and "aah!" like spectators before fireworks. For the rest of the walk back to Arkaba Homestead, my mind drifted into romantic musings on "untrammeled nature" and "eternal natural cycles"—that sort of typical outdoorsy endorphin high. But the sight of a dozen large rabbit warrens, goat-browsed bullock bush, and the "hectic catastrophe" of invasive weeds along Arkaba Creek near the Homestead imposed a necessary corrective. Arkaba's concerted and expensive conservation efforts prove that the beautiful property, though isolated, is by no means pristine. Indeed, Arkaba called into question the very idea that any corner of Australia could be considered untouched. A radical theory of restoration biology takes the term rewilding and argues for restoring ecosystems to a state of pre-civilization integrity. But what would that even mean in Australia? Of course European settlers changed the landscape, but then so did Aborigines, who arrived on the continent some 60,000 years ago. Their hunting may have contributed to the extinction of numerous species of giant kangaroos and other grazing megafauna, and they introduced dogs (the ancestors of today's dingoes) and the practice of large-scale burning, in part to improve hunting habitats. Man himself is arguably the most pervasive exotic species in Australia, and the most destructive. The same holds true everywhere in the world, a fact that invalidates the utopian conservation ideal that we can simply stand back and let the earth return to some prior, Edenic state. Arkaba proves that conservation is not a passive stance— letting nature run its course—but a permanent land-management activity. Arkaba's conservation requires an ongoing, annual investment of money and manpower, just as surely as the grazing it replaced. Bevan drove this point home the next day, when he took me to track a radio-collared feral cat, part of a study of the movements and habits of this hugely destructive predator. He's eliminated 173 cats from Arkaba in five years, and he wants to know how many more remain. Probably a lot. Wildlife biologists estimate that Australia's feral cats will each kill about a dozen reptiles, birds, small marsupials, and mammals a day, for a combined loss across the continent of 70 million to 80 million native animals every day. "We're headed toward a precipice at a great rate," Bevan remarked, as he pulled out his radar tracking equipment. This is the story of the goat versus the rock wallaby, he said. The cat versus the bilby. Bevan was not a pessimist, though. No conservationist can afford to be. Instead, he focused on the positive impact of Arkaba's other eradication efforts. For example, there's been a spike in echidnas since fox populations were suppressed by the aerial distribution of poisoned bait. 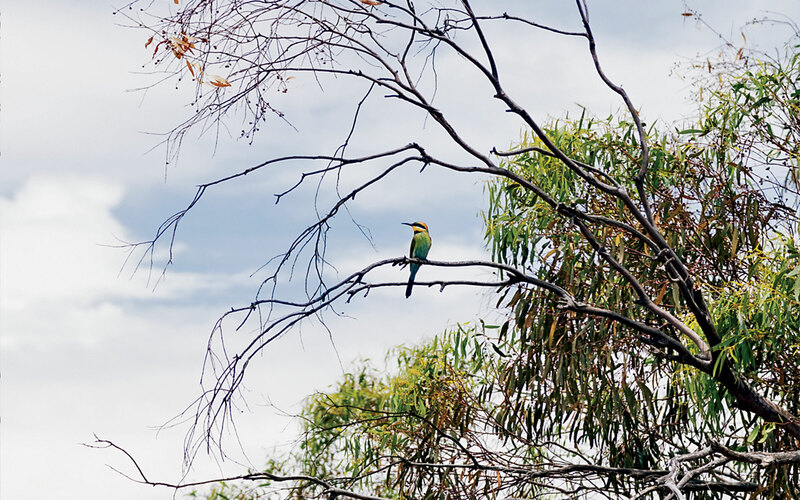 Bevan tracked the collared cat to a hollow river red gum, which he compared to an "apartment block for life," a habitat utilized by all sorts of native species, from birds of prey and common brush-tailed possums to witchetty grubs. He explained that the trees are remarkably tough and have evolved to survive extended drought and to recover from deep wounds. He focused my attention on the hollow where the cat was denned and how the tree's cambium, or growth layer, had started to "re-sheath," or heal over the gap. Such a recovery, Bevan mused, suggested a degree of resilience that an optimist might metaphorically apply to Arkaba's overall mission. "When something is that far gone and looks shot to hell, it can still come back," he said. "Good conditions continuing, it will look grand again." From Adelaide, rent a car for the five-hour drive to Arkaba through the Clare Valley wine region. Or, Port Augusta is a 75-minute drive from the property and has weekday flights from Adelaide. Charter flights and private drivers can also be arranged through Arkaba. 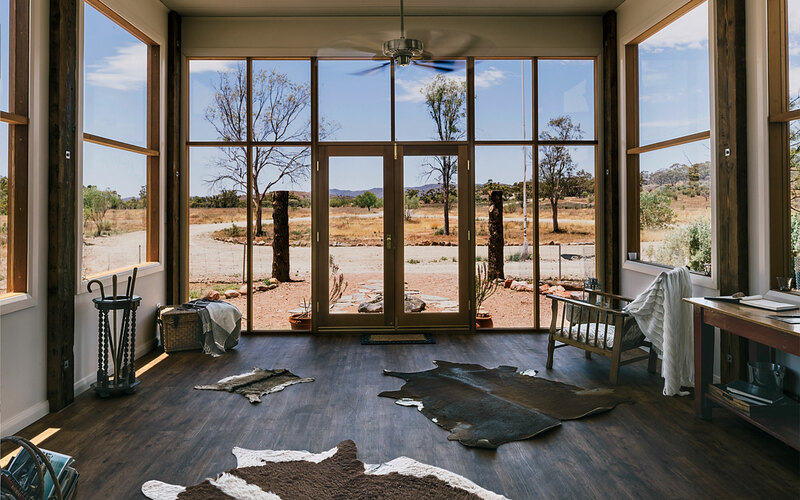 Arkaba offers a one-night stay at the historic Homestead and a three-day trek through Australia’s southern outback with stays at luxury camps along the way. Meals are served family-style and accompanied by wines from the region. The walk is about 27 gorgeous, easy-to-moderate miles (about 10 per day) with guests’ luggage ferried by jeep. arkabawalk.com; from $1,568 per person.